Listen to a NPR St. Louis on the Air interview about the book. Listen to a Iowa Public Radio interview about the book. Set against a backdrop of murder, intrigue, and industrial labor conflict in the early twentieth century pearl button industry, Shell Games graphically portrays one of the most important battles in the fight for safe and humane working conditions. 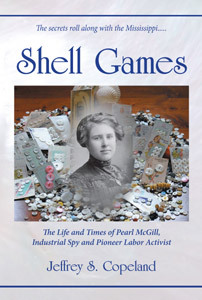 Filtered through the thoughts and emotions of Pearl McGill, a woman who stood heroically against the injustices destroying the lives of so many around her in the shops and factories, this conflict vividly comes to life and underscores many of the concerns contemporary workers still encounter.